Graham, Joseph, William Newman, and John Stacy. 2008. 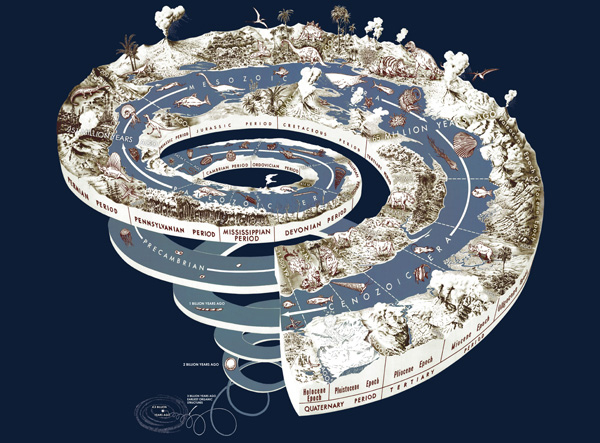 Geologic Time Spiral: A Path to the Past. A collection of 100 maps are now scattered around campus after circling the globe. “Places and Spaces: Mapping Science” opens Thursday at the University of Miami with a reception at 6 p.m. in the Stanley and Jewell Glasgow Hall, located in the School of Architecture. The exhibit, which features scientific maps illustrating human and scientific advancements around the world, will be at UM until Dec. 11. Pieces from the exhibit will be displayed at the Jorge M. Perez Architecture Center and in the first and second floors of the Richter Library. The exhibit was started in 2005 and originally featured just 10 maps. Since then, 10 pieces have been added each year as the exhibit has traveled to various locations, such as Washington D.C. and Belgium. Themes for previous exhibits ranged from The Power of Forecasts to Science Maps for Kids. The graphics not only illustrate a wide range of topics, they also cover a large time span, according to Alberto Cairo, assistant professor of the professional practice at the School of Communication (SoC) and director of the Visualization Program at the Center for Computational Science. “The exhibit doesn’t just include modern examples, but also classic examples and older examples…from the 19th century and older,” said Cairo, who is on the organizing committee for the exhibit. UM is the first venue to display the most recent 10 maps, marking the exhibit’s completion. These new additions explore the future of scientific mapping. Scientific mapping includes artwork that is not just visually appealing, but also “highly informative, illuminating, and insightful,” Cairo said. These maps can include anything from diagrams and network illustrations to graphs and pie charts. The UM installment of the Places and Spaces exhibit is curated by Katy Borner, a professor of information science at Indiana University and a Ted Talk speaker. Borner is one of the people who helped conceptualize and found the exhibit in 2005, and has been the curator for many of these events. Borner, who will speak at Thursday’s event, is the first of many scientific mapping designers and researchers who will come to UM this fall as part of a lecture series. Places and Spaces was brought to the UM campus by the Center for Computational Science, the College of Arts and Sciences, and SoC. “The study of data visualization crosses disciplines and has applications in a variety of academic areas,” said Thomas J. LeBlanc, UM Executive Vice President and Provost in a press release. All of the events the exhibit is hosting will be free to UM students and open to the general public.